Carefully, she untied the bow, and tumbled out the first few pieces. Her mouth made an "O" and she began lining them up, one by one. As she drew out each remaining piece she squealed with delight and her eyes filled with tears. My kids will love this, it will be part of our family tradition! She confessed to having several other sets, each one so loved... and I know, because I have, perhaps, too many of my own to count. 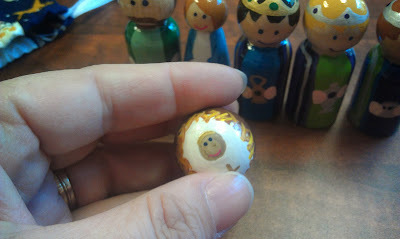 When each piece of this little nativity was lined across the counter, she shared that she really wanted her kids to know that this is what Christmas is all about. I'm glad this truth is growing, because when the magic of Santa has faded, Jesus is still shining bright, and Christmas is still a celebration of love and life. She picked up that little baby Jesus again for one more look before tucking her small treasures away, and it made me smile. I was thankful for not second-guessing that God-nudge. Thankful, for passing along a piece of my heart... the part that shines and loves like Jesus. And there it is again. Your giving spirit blessing yet another person in your path. Hugs. What a sweet thing you did - a kindness prompted by Jesus. Your gift will keep giving each year the family uses it.